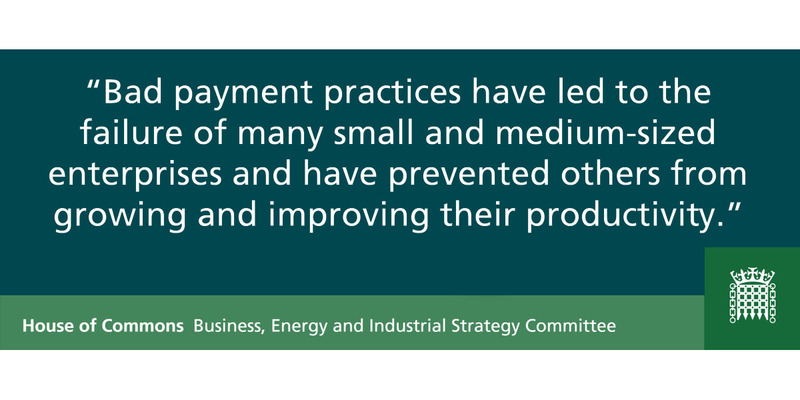 The government should introduce tougher rules for larger companies that treat smaller suppliers 'disgracefully' with late payment or excessively long payment terms, says the Business, Energy and Industrial Strategy Committee. The committee published its Small Business and Productivity report, with findings that late payment had a significant impact on businesses ability to invest in growth and productivity and had led to the failure of many small and medium sized enterprises (SMEs). The report recommends a statutory requirement for companies to pay within 30 days is introduced, that all medium and large companies be required to sign up to the Prompt Payment Code, and there should be powers for the Small Business Commissioner to fine companies who pay late. The report also recommended that companies working on public sector contracts be required to pay their own supply chain within 30 days. The construction industry was also identified as a sector where poor payment practices are rife, and the Committee called for changes to tackle the abuse of retention payments within the construction industry, proposing that independently managed project accounts are introduced, and money withheld only when there is a good reason to do so.